How to paint with only two colours, three colours and then Four. This lesson shows you how to paint first with only two colours and then adds a third, white, followed by a blue. After some colour mixing tips, there’s a small project to implement what you have learned. I hope it will give you the confidence to dive in yourself. Who is this For? 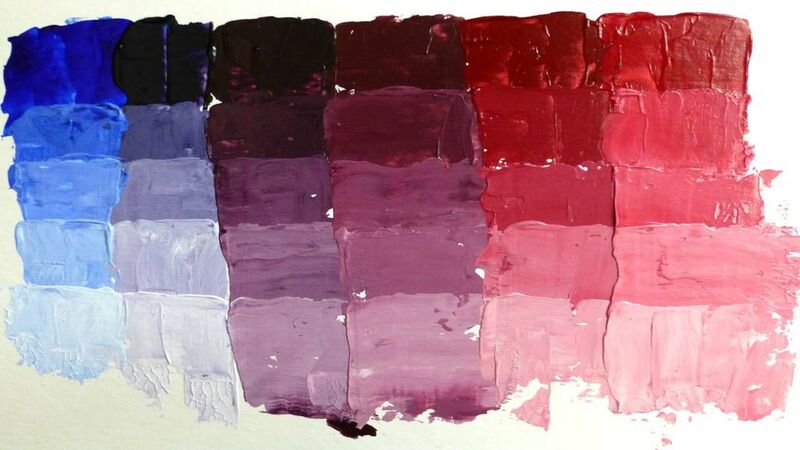 Beginners – Yes, and others who want to review the basics of colour-mixing. 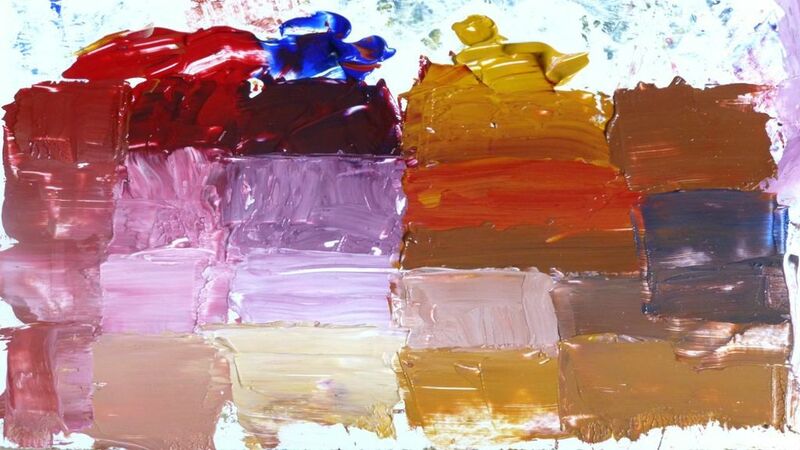 When you are faced with a set of 10 or more colours as a beginner, it can be hard to decide which colours to use together, and how to mix them for your painting . This will show you how. What if you don’t need to use more than three or four colours to get a pleasing result? In fact, that’s a very good way to start. I’ll give you several reasons why a minimal palette can help you make a better picture. 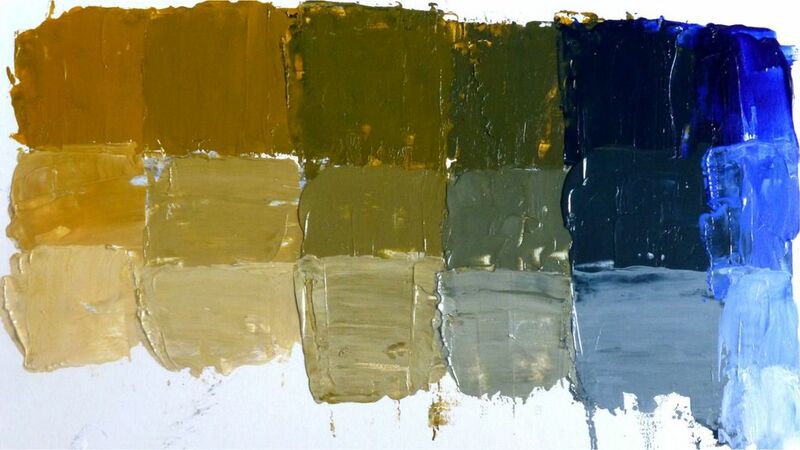 Why use a limited palette? • Uncover the hidden ‘warmth’ or ‘coolness’ of colours. Oh, and joining in with exercises such as this one gives you plenty of practice. You don’t need to do exactly the same subject as the one in my example below, but do try to use the same, or very similar colours. There will be more about other combinations in other articles. I have used many types of paint to make pictures in my time, some with more success than others but always with a sense of discovery. I didn’t have any paints of my own as a child and was confined to coloured pencils and crayons when at home. At school, I remember some very powdery stuff that we mixed with glues and things to paint papiér maché objects. It wasn’t until much later that I was able to buy some paints. First I bought watercolours – student quality pans. At the time I wanted to paint Big so that didn’t really fit the bill. I then went and bought a few small pots of house paint – you could get oil based gloss for doors and windows in small pots. Back then I lived in a shared bedsit so only bought three colours, a deep maroon, a sort of camel-beige and a fairly dark blue. I may have added a pot of brighter red and some white later on. The lack of many colours proved to be a form of early training. I guess it was subliminal because even now that I have whole collections of colours, I seldom get more than three or four out to start a painting. Sometimes I dive back into the box and add an accent colour, or something, that will change the mood of the painting. The point is, you don’t need to be put off having a go with acrylics by trying to use an overwhelming number of colours. The paints I use are not pure pigment, but are ‘hues’. This means that they contain synthetic colours, rather than the pure pigment and therefore less expensive and non-toxic. Some well-known brands have colours labelled ‘hue’ in their artist quality ranges. Synthetic paints can be can be very high quality and have good coverage but different colours do vary, and the same consistency and the same cover cannot be expected from every tube of paint. 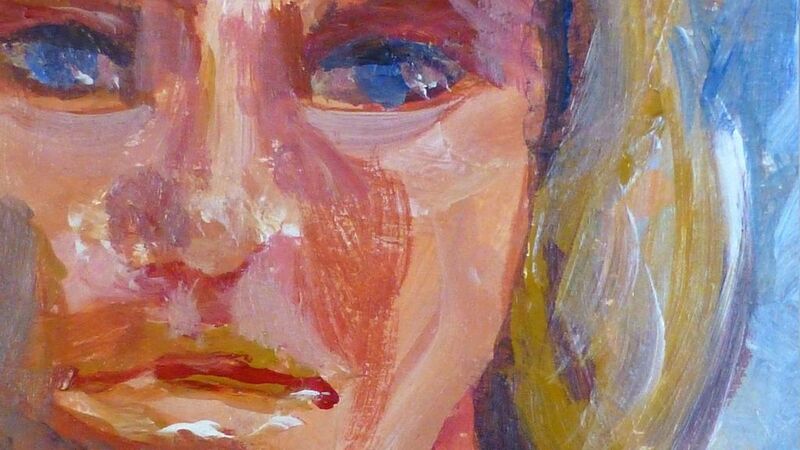 For this exercise I am using ‘Outlines’ Acrylic paints, but you can use any acrylics, oil paints or watercolours. You can use any kind of paint with similar colours. The type of paint you use will affect the results in terms of texture and transparency, but the principles of using a minimal palette remain the same, whatever the medium. I hope it will give you the confidence to dive in yourself. and Titanium White for paler versions. 2. A brush or pallette knife. 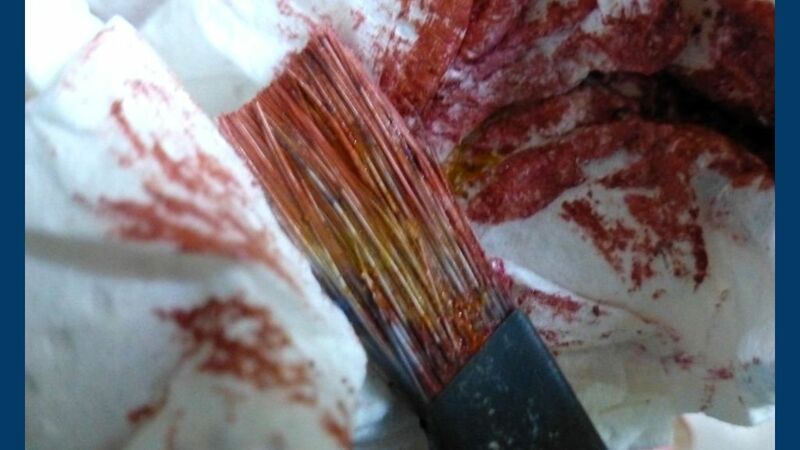 I prepared two brushes, one hog-hair 1/4 inch and one soft synthetic no.9, and a palette knife. 3. Something to paint on. This is known as ‘the support’. I dug out a some pieces of mountboard from my off-cut box. 4. 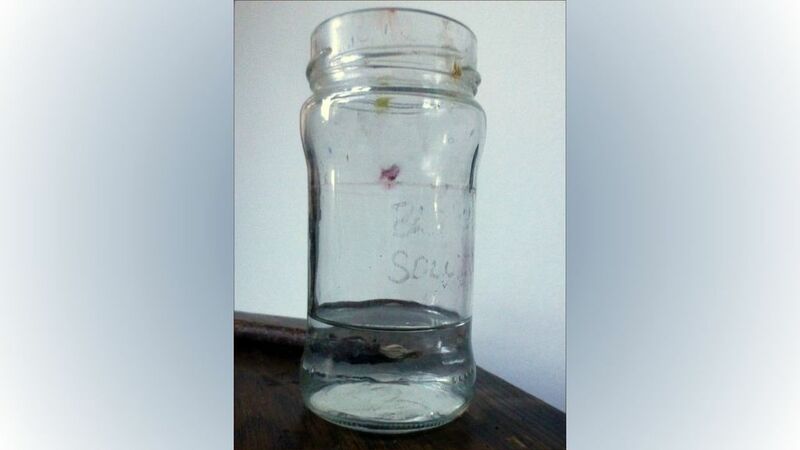 A jar for water. 5. Some rag or kitchen roll for wiping and removing excess water. Are you ready? Let’s Mix! Pour a small amount of water* into your jar, lay out the four tubes of paint, the palette and the brushes. First we will see how a different amount of colour affects the final colour by mixing on the palette. You can add white as you do each step, or you might find it more useful to mix each colour again in a separate session. 1a. 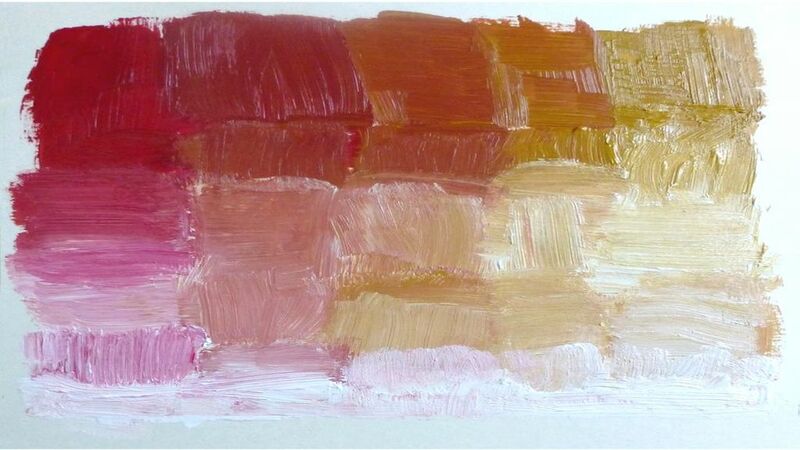 Squeeze a blob each of Crimson and Yellow Ochre onto your palette, not too much, you can add more later if needed. Why? – Because acrylics dry faster than other types of paint. 1b. Separate about a pea-sized blob of the yellow and a tiny amount of crimson and mix together. You will see the colour has become more peachy. 1c. Now add more crimson. The colour turns more towards orange. 1d. Add yet more crimson and you will see the colour become a rich red with a warm tone. When painting your pictures, I recommend you always add small amounts of the darker colour to the lighter one until you reach the shade you need. Darker colours are dominant and you may end up with too much paint. Do the same as Step 1, only this time using the Blue and yellow, You will see that you get first a duller darker yellow, different shades of a rather murky green and a rich dark blue. And again, repeat the procedure using the red and blue. Adding just a little blue makes a rich dark red. As you add more blue it will change into maroon, then a very dark purple. Note: If you are using watercolours for these exercises, you would usually be adding more water to make lighter colours, although you can use a white for a more opaque effect. The instructions for acrylics also apply to oils. Step 4. First we will add white to two-colour mixes. 4a. Make a Crimson and Yellow Ochre mix from Step 1. 4b. Now Sqeeze some white paint onto your palette in a line. 4c. Add the mixed colour to the white starting with a small amount and increasing the intensity as you go along. 4e. Make an Ultramarine Blue and Yellow Ochre mix from Step 2. 4g. 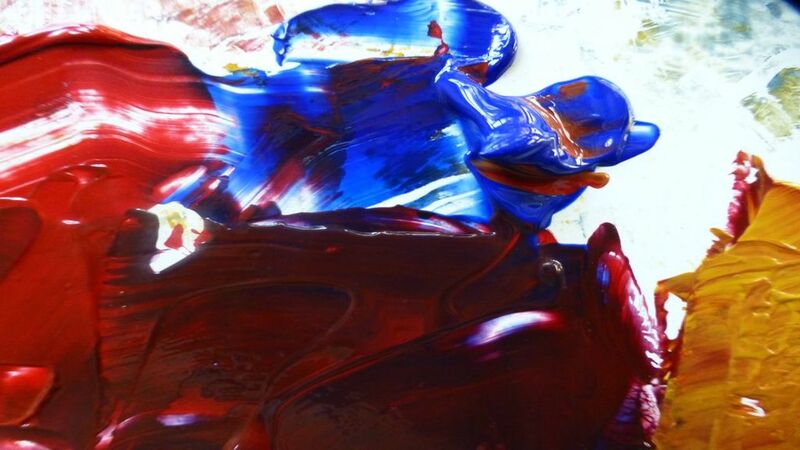 Make a Crimson and Ultramarine Blue mix from Step 3. You will find the colours easily become very dark, almost black even. You can try several combinations. Don’t expect to get the same results as mine – it’s unlikely, and you have to remember that the computer screen changes things too. Step 6. Now we will add white to three-colour mixes. 6a. 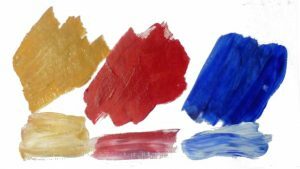 Make a Crimson, Yellow and Ultramarine Blue mix from Step 5. 6b. Add a little of the colour mix to the white, spread it, and add more colour in stages keeping a bit of each result, as you did in steps 4b and 4c. 6c. Make a different mix of the three colours and add to the white – you can repeat this as many times as you like to see how the colour changes with different proportions of red, blue and yellow. 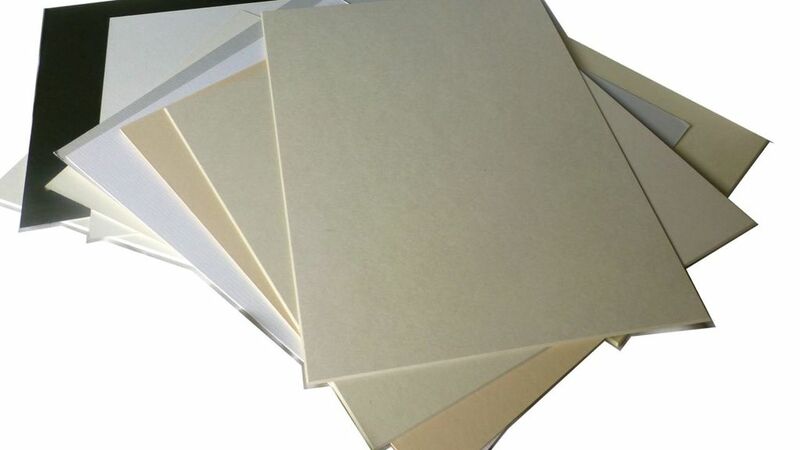 As mentioned earlier, it is best to add Darker colours to Lighter colours in increasing amounts until the desired result is achieved. This is because many dark or bright colours can be very strong. This shows various mixes done on the pallet. I confess I did the opposite, adding white to the colour, flying in the face of my own advice! But there, that only proves that you can play around as you like – Much advice is intended as a guide to save frustration and waste and to get you unstuck when you don’t know what to do. When you make a different mix of the three colours and add white you will really begin to see the huge range of colours you can use with only these 3 colours. Imagine how that will grow when you use a different set of pure colours. This mix makes quite muted hues, suitable for many subjects and can be very subtle. You can make rich browns, soft or menacing greys and creamy skin tones. A lovely warm rusty colour is possible and fairly bright pastels can be used in your painting. By mixing two colours and adding a third you will have plenty of hues and shades at your disposal. 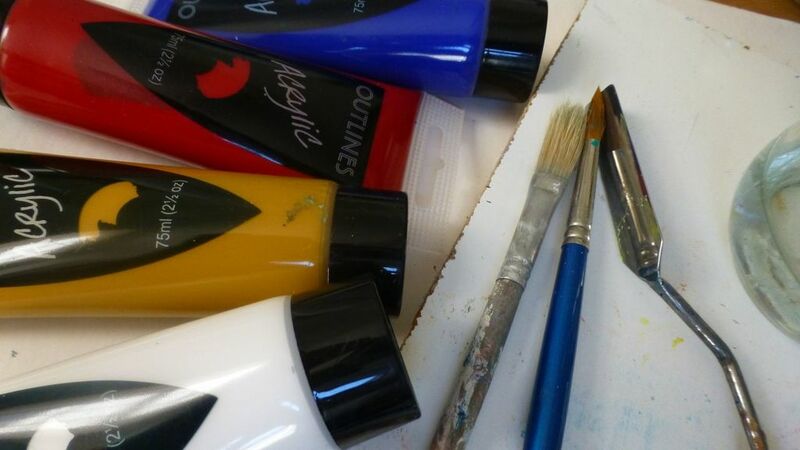 You will see that the lighter mixes are fairly soft, so if you want strong vibrant colour, you will go for a different red blue and yellow and still be able to use a limited palette. Time to try making these mixes on the fly! Let’s try it with a small project – a girl’s face using three colours and white. The Face was sketched with rough dark and light areas using the red, yellow and white and the background is predominantly blue with greyish tones ( by adding some yellow/red mix). Shadows on the face have hints of blue and purple. As you see, the colours cross over and are repeated in the subject and the background. I hope this has shown you the huge range of colours that can be achieved and that you had fun doing some of the mixes. 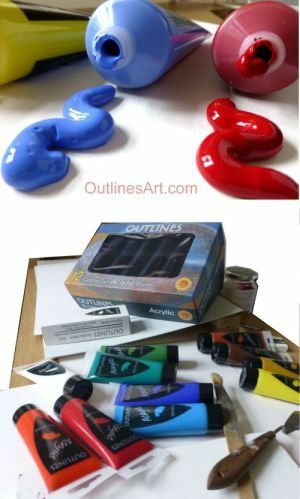 More demos of simple paintings can be found here for the blue/red and yellow/blue combinations – also some examples using the paint thinned to be transparent. Click here Outlines Acrylic paint 75ml for a single tube if you need extra Titanium white for mixing. Links to other resources referred to in the instructions or to to other articles that may be of interest will be added here. Sign up now to be notified of more lessons and tips, delivered straight to your inbox. Discover the benefits of painting with just a few colours as a beginner, how to mix them and the results that can be achieved.